The designations employed and the presentation of material in this information product do not imply the expression of any opinion whatsoever on the part of the Food and Agriculture Organization of the United Nations concerning the legal or development status of any country, territory, city or area or of its authorities, or concerning the delimitation of its frontiers or boundaries. The mention of specific companies or products of manufacturers, whether or not these have been patented, does not imply that these have been endorsed or recommended by the Food and Agriculture Organization of the United Nations in preference to others of a similar nature that are not mentioned. 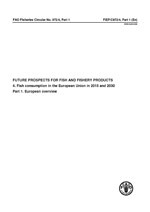 Future prospects for fish and fishery products. 4. Fish consumption in the European Union in 2015 and 2030. Part 1. European overview. This report presents the major results for fish consumption (consumption per capita and apparent consumption), production (captures, aquaculture and commodities) and fish trade (exports and imports) estimations and projections for 28 countries in Europe from 1989 to 2030. The projections show an increase in the demand for seafood products to 2030. The average per capita consumption by the 28 countries will move from 22 kg/caput/year in 1998 to 24 kg/caput/year in 2030. The two additional kilograms per capita signify that the net supply will have to increase by 1.6 million tonnes (Mt) (respectively 1.1 Mt for the 2 extra kilos per person and 550 000 tonnes due to the 22 million population growth over the period). Aquaculture growth will not be able to meet the increasing demand; therefore, imports are projected to rise to 11 Mt (+15 percent from 1998), increasing the dependency of Europe on the rest of the world for its fish and fish products.